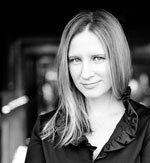 Born and raised in Australia, composer Leah Curtis writes and produces original music scores and soundtracks for orchestras, choirs, choreographers, solo artists, film directors and game developers. She has collaborated with key international film directors including Fawaz Al-Matrouk (Kuwait/Canada), Damien Power (Australia), Adam Habib (USA), Sean Byrne (Australia), Steve McGregor (Australia) and Digvijay Singh (India). She has orchestrated for composers including Alex Wurman (composer of Anchorman, Something Borrowed, and March of the Penguins) Johnny Klimek and Reinhold Heil (composers of Sophie Scholl, The International, and Run Lola Run). Curtis's works have been performed by orchestras from the Sydney and Tasmanian Symphony to the Hollywood and Prague Studio Symphony, and artists including Lisbeth Scott, The Australian Voices and Choristers of St Paul's Cathedral. She has been recognised by the Park City Film Music Festival, Hollywood Music in Media Awards, U.S. Department of State, Australian American Fulbright Commission, American Australian Association, Aspen Music Festival, BMI/University of California Los Angeles, American Society of Composers Authors and Publishers, and Queen Elizabeth II Trust, among others, for her accomplishments and artistry as a composer and scholar. Significant scores include Clarity, commissioned by Kathleen Gallagher for flute with vocalisations and cello, and choral work Journeyman, commissioned by The Australian Voices. Cinema scores include the Kuwaiti American war film To Rest in Peace and Roman historical drama Exitus Roma. A graduate in music from the University of New South Wales and screen composition (Master of Arts, Honours) from the Australian Film Television and Radio School in Sydney, Curtis was visiting composer with USC Thornton School of Music Scoring for Motion Pictures and Television, and studied with John Corigliano, Jeff Rona, Jack Smalley and Thomas Haines at the Aspen Music Festival, as recipient of a 2006 Fulbright Postgraduate Award. Journeyman : SATB choir (2009) Commissioned by The Australian Voices, Stephen Leek. Clarity (duos: flute, cello) (2004) Commissioned by ArtsACT, Kathleen Gallagher. Dawn to darkness : string orchestra (1998) Commissioned by Sydney Symphony.